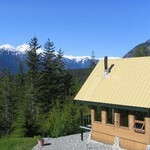 Bella Coola is consider a remote and pristine area of British Columiba's West Coast. There are basic amenities, shops, accommodations, a service station and health services. The artists and First Nations residents are a common part of the areas special spirited inspirations. The area is a sought by naturalists, artists and photographers for its spectacular wildlife viewing and scenic landscape. During summer months, BC Ferries operates a ferry between Port Hardy on Vancouver Island and Bella Coola. Bella Coola is the traditional home of the First Nations, the Nuxalk Nation. The Thorsen Creek Petroglyphs include over 100 native rock paintings, which indicates that this area had been populated long before written records. It has also had a strong Norwegian heritage influence resulting from settlement in the area in the 1890’s.